* All of the flowers seem to implode into one other and a woody note comes to the forefront. * There is a hint of spice in the warm base with some resins sweetening the wood. Summary: I am back from a long break of reviewing perfume. and Broken Glass is one that reinspired me. I wore Triton a few times and noticed it was a complete 180 from the bongwater scent that didn’t work on me. Triton was crisp, atmospheric, and pleasantly astringent – which honestly doesn’t make sense when you read it, but in texture and experience that is the perfect description. Broken Glass is creative and interesting without being a scene stealer. It doesn’t demand attention by screaming but lures you in with interesting changes over its development. Longevity is excellent – well over 12 hours, but it is not overwhelming. It feels like a second skin, present in your space but not burdening you with a heavy film. 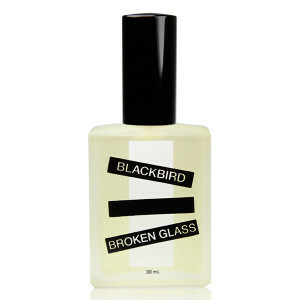 Blackbird Broken Glass is available from Blackbird Website. Disclaimer: Sample provided by Blackbird. Image courtesy of Blackbird website.